Besan Toast or Bread besan toast, you can say as savory eggless version of French toast which is easy to make and quite tasty too. Not only as breakfast recipes but you can also serve it as healthy evening snacks too. It is the low fat version of bread pakora. 1. Take a bowl and add chopped, onions, capsicum, tomatoes, green chillies and coriander leaves. 2. Now, add besan, hing, turmeric powder, red chilli powder and salt. 3. Add water and whisk to make medium consistency batter. Whisk it very carefully so that no lumps will be present in the batter. Don't make the batter too thin. 4. Now, cut the bread slices in two triangle shape. 5. Heat 1 tbsp oil in a frying pan. Dip the bread slices into the batter and coat the bread evenly with batter by your hand. Now, quickly place batter coated bread slices on the pan as keeping the bread too long in the batter could break the slices. 6. Now when one side of the slices will cook (fried) and browned, flip the other side and fry it. 7. Remove from the hit and serve it immediately in a plate. Fry other bread slices in the same way. 8. 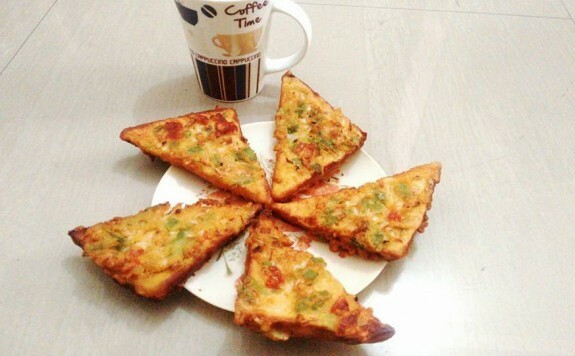 Serve the bread besan toast with tomato ketchup.